A bulletin board at the North Korean Embassy in China now features photographs leader Kim Jong-un meeting South Korean President Moon Jae-in and U.S. President Donald Trump, a change from the pictures of missiles that adorned last year. 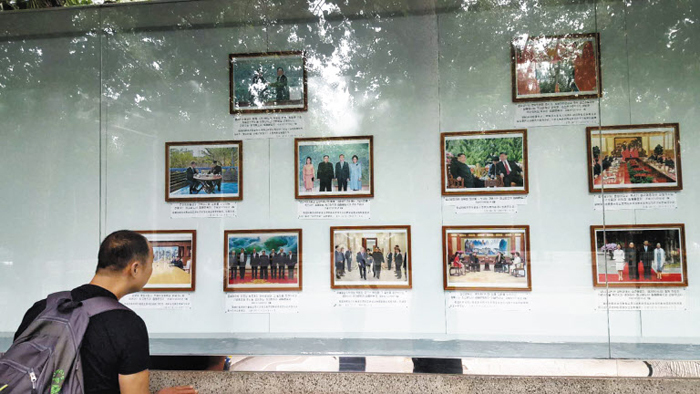 The board is next to the main entrance of the North Korean embassy in Beijing and previously only featured pictures of Kim meeting Chinese President Xi Jinping during his first visit to China. Other photos show Kim meeting Russian Foreign Minister Sergei Lavrov and International Olympic Committee President Thomas Bach. Last year, the board was festooned with photos of North Korea's ballistic missiles.